Advance Aviation Jet prides itself on being Thailand’s first Gulfstream private jet charter operator, offering the luxurious Gulfstream G200 jet with its non stop range more than 6 hours. 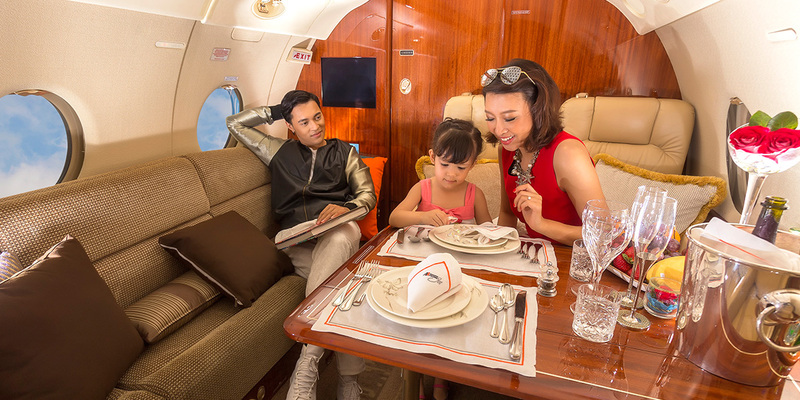 Based in Bangkok, these premium super-midsized private jets serve destinations throughout the region and beyond. At Advance Jet, we offer you a full latitude; a freedom to design your own itinerary and point of landing; a peace of mind to enjoy and relax on every flight. We instill our team to treat each and every mission as if their own family were on-board. Both of our sky team and on ground customer services for jet charter will ensure that every step of your voyage; from the point of placing enquiry, making reservation, boarding the flight to landing, you are extended with Advance Jet’s CORE value: Comfort, On-time, Reliability and Efficiency. We commit to excellence in Executive Fixed-Wings or Private Jet Charter Service Industry. Our team of dedicated Aviation Specialists will fulfill your private jet charter needs and provide you with timely and professional consultations on the most suitable charter aircraft options available. Our response time to your first inquiry email is within 24 hours.